Miami Beach-based Quinn Harrelson seems to have a foot in every creative door. Harrelson has won a La Plume award for short story writing, and a 90-second Newberry award for his claymation film based on the book Mr. Popper's Penguins. He played a young lawyer in Bruce Weber's short film "Don't Steal The Jacket." Was photographed by Weber for two recent editorials in American Vogue. So finding time to paint would seem difficult, but not so, says Harrelson. "I love painting, especially design-related images of iconic furniture and portraits of designers I admire." 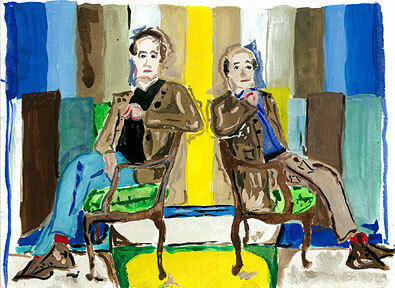 A painting of Francis Elkins' loop chair was featured in the most recent Cultured Magazine. Quinn will be going into seventh grade at Ransom Everglades school in the fall.